Hair loss is a natural process. The average person has about 100,000 to 150,000 hairs and loses nearly 100 of them each day. Finding hair in your shower or hairbrush is normal. Only extensive hair loss is cause for hair restoration treatment. Many patients want to know if hair loss is reversible. The answer is not black and white. Depending on your unique situation, re-growing hair may be possible, but for other patients, more invasive medical hair restoration treatment is needed. At True & Dorin in New York, NY, we can restore hair growth from a variety of biological causes, trauma, or certain medications. Hormones, such as an overproduction of androgens (a male hormone present in both males and females) as well as hormonal changes from childbirth and pregnancy. Illnesses, such as lupus, diabetes, iron deficiency, anemia, or certain eating disorders can all affect hair loss. Genetics can increase a person’s chance of male or female pattern baldness. Certain medications, including chemotherapy drugs, blood thinners, certain blood pressure medications, and oral contraceptives can also lead to thinning hair or hair loss. Trauma to the scalp, including surgical scars, head injuries, or other skin conditions of the scalp. Autoimmune conditions, such as alopecia areata, attack healthy hair follicles, but hair can be regrown. Diet or malnourishment can contribute to hair loss. Cosmetic procedures, like bleaches, tight braiding, or chemical treatments to hair can cause significant damage to the scalp, leading to follicle damage or hair loss. However, it is important to note that damage to hair alone does not often lead to baldness. Some forms of hair loss can be naturally reversed, without invasive hair restoration techniques. Drs. True and Dorin can determine the cause of your hair loss, and determine whether or not it can be reversed naturally or through more invasive restoration techniques. Alopecia areata: Usually appearing suddenly, this condition causes uneven hair loss in younger adults or children. Sometimes, it leads to total baldness, but for many patients, natural hair growth returns in just a few years. Trichotillomania: Also prevalent in younger adults and children, this psychological condition results in patients pulling their own hair out, resulting in follicle damage and hair loss. Once the behavior is treated, hair growth can usually return to normal. Telogen effluvium: When natural growth cycles for hair change, temporary periods of high-volume shedding and thinning can occur that result in a thin or bald appearance. This is usually a temporary, reversible condition once hair growth stages develop. The following conditions are usually considered naturally irreversible, and treatments such as FUE or other hair transplant methods are the treatment method needed to restore natural-looking hair growth. Involutional alopecia: This is a common condition of hair-thinning with age. Androgenic alopecia: This genetic condition often presents itself as male- and female-pattern baldness. With men, significant hair loss can happen beginning in the teenage years, while women often experience hair loss in their 40s to 50s. Male pattern baldness is identified by a receding hairline, and hair loss from the crown of the scalp. Female pattern baldness is characterized by general thinning of hair across the entire head, with concentrated hair loss around the crown. 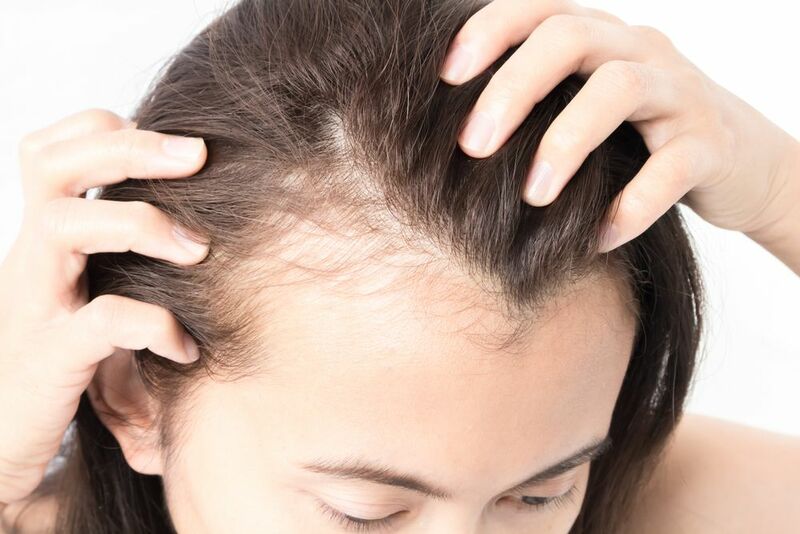 Scarring alopecia: Permanent hair loss can occur from certain conditions affecting the skin, such as fungal infections, acne, folliculitis, or other skin infections of the scalp. Additionally, some cosmetic procedures can cause damage to the scalp skin tissues resulting in permanent hair loss. Hair loss can happen for many reasons. By scheduling a consultation with Dr. True or Dr. Dorin, you can discover the cause of your hair loss, and the most innovative and effective treatment methods for restoring healthy hair once again. We look forward to talking with you soon. Call us at (212) 826-2525.